Sound & Light Show at Chandela Temples. 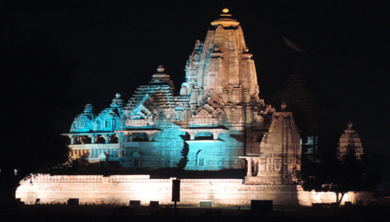 The fascinating Light and Sound show on the Western Group of temples complex, that reminds the life and times of the great Chandela Kings and mark out the story of the exclusive temples from the 10th Century to the present day. The 50-minute fascinating show is held in every evening in English. The tourism department organizes the show, which is not only entertaining but also very informative. 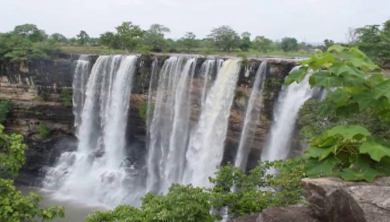 The Raneh Falls is a natural water fall on the Ken River, located in Chhatarpur district approximately 20 Kms from Khajuraho in the Indian state of Madhya Pradesh. 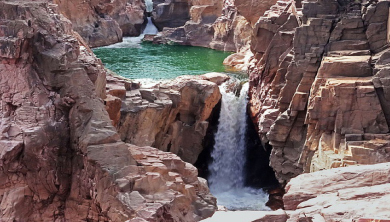 The Ken River forms a 5 kilometres long and 30 metres deep canyon made of pure crystalline granite in varying shades of colours ranging from pink and red to grey. There is a series of waterfalls in the canyon. The larger and smaller falls run all through the year. Other seasonal falls appear during monsoons. Excursion to Panna National Park with Afternoon Jeep Safari. Morning pickup from hotel and drive to Panna National Park. Panna National Park is a national park located in Panna and Chhatarpur districts of Madhya Pradesh in India. It has an area of 542.67 km2. It was declared in 1994 as the twenty second Tiger reserve of India and the fifth in Madhya Pradesh. 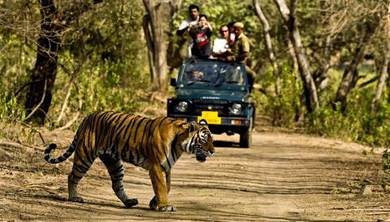 On arrival enjoy pre-booked afternoon shared jeep safari at Panna National Park. Jeep Safari on Shared Basis. Shaded in the Panna district of Madhya Pradesh, the Pandav Falls grace the banks of Ken River and reign at a height of around 30 meters. Named after the Pandava brothers from the Indian Epic Mahabharata who are believed to have been there, the area is loaded with natural gems. A deep gorge in the hillside collects the cascading water in the form of a huge pool below. Spending one entire day amidst these beautiful waterfalls will ensure you the solitude that your soul craves.